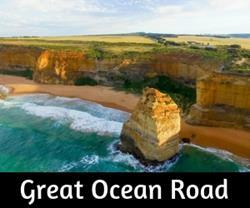 Bike ride or walk along this great trail, ideal for families. 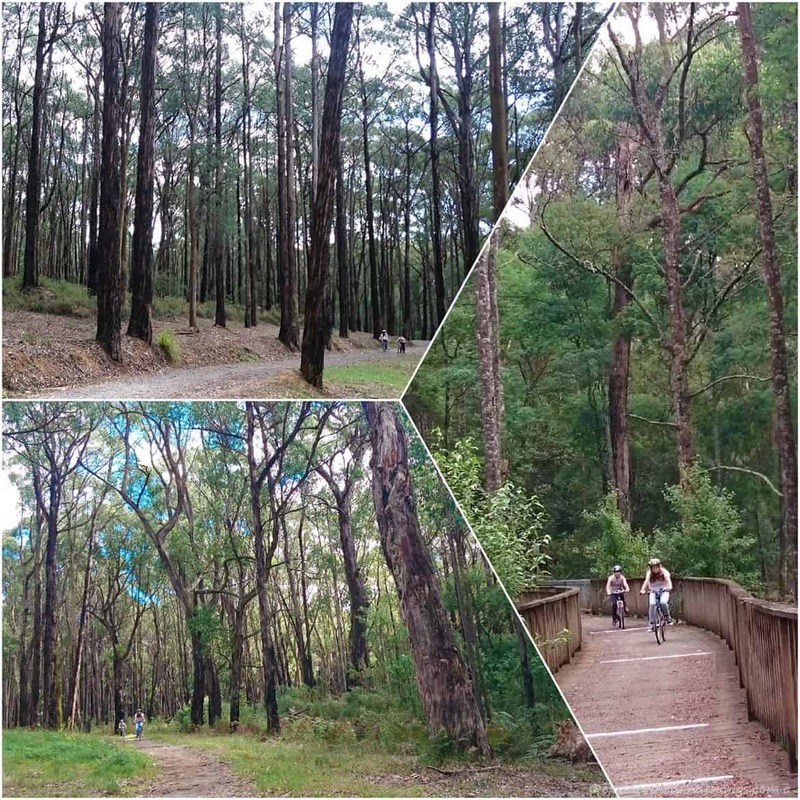 A dog and pram friendly walk from Emerald Village to Cockatoo, with an option to continue another 6.5 km on the newly opened (2018) section of the multi-use trail to Gembrook. 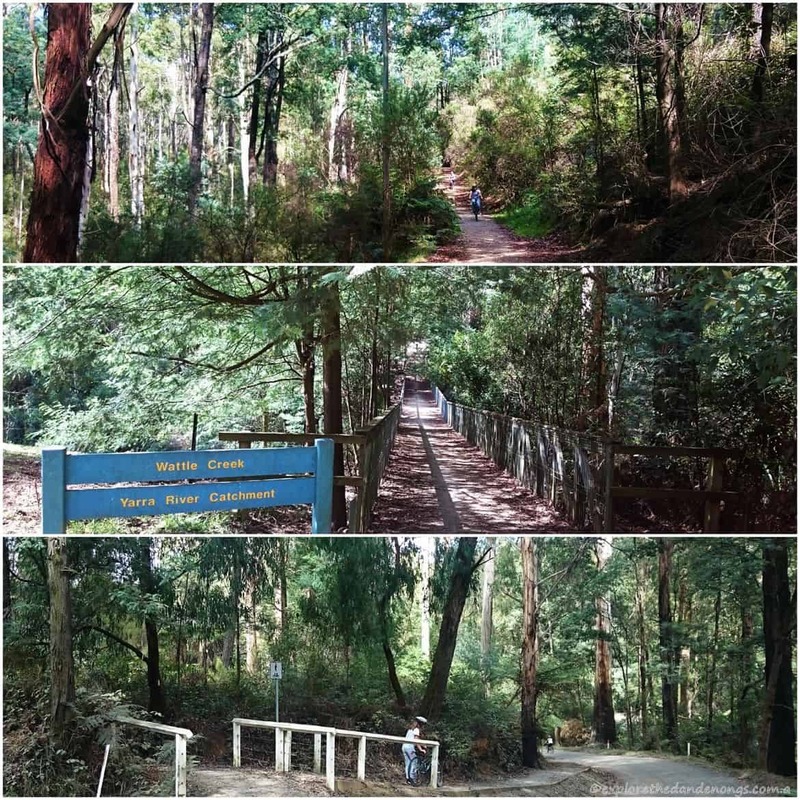 Leaving from Emerald, Cockatoo or Gembrook, the trail follows the Puffing Billy Railway line for some of the way, passing through Emerald Lake Park and Wright’s Forest, crossing a few roads along the way and passing by one of Puffing Billy’s wooden trestle bridges. Some sections are downhill and reasonably steep between Emerald and Cockatoo though not extreme. 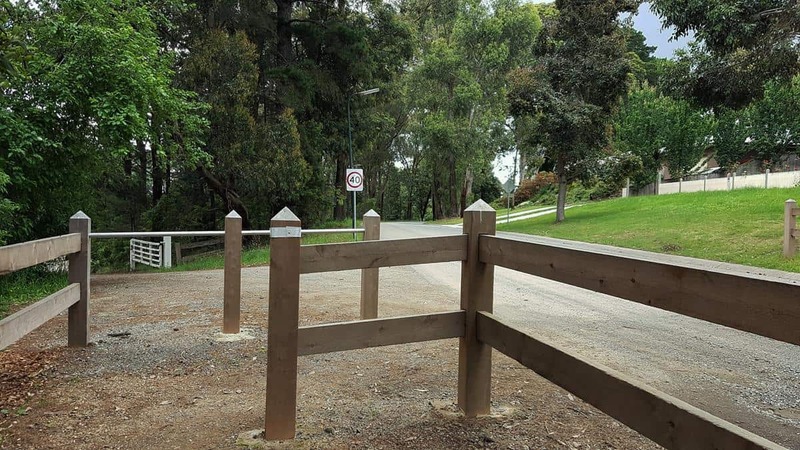 Parking is available in Emerald along Kilvington Drive, Emerald Park Lake (fees apply) in Cockatoo or Gembrook. 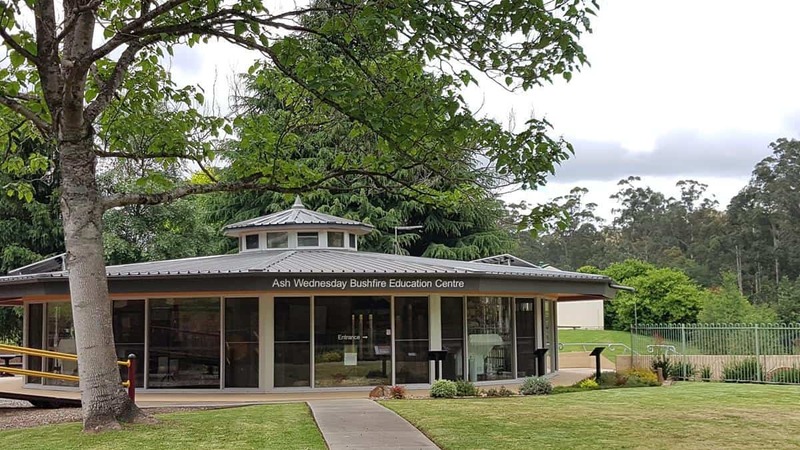 Cafes and restaurants in Emerald, Emerald Lake Park, Cockatoo and Gembrook. 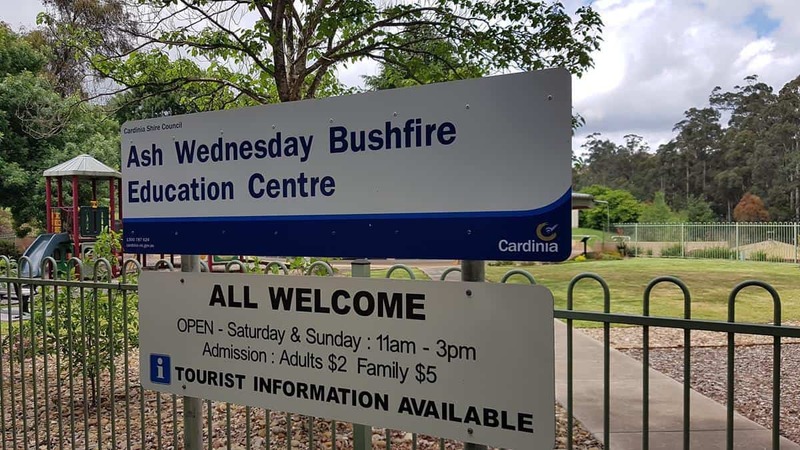 Picnic & BBQ facilities in Emerald by the playground on the corner of Kilvington Drive and Heroes Avenue and at Emerald Lake Park. Public bus transport is available between villages, it could be an option to ride or walk one way, use public transport to return to collect a vehicle and then pick up bikes perhaps. 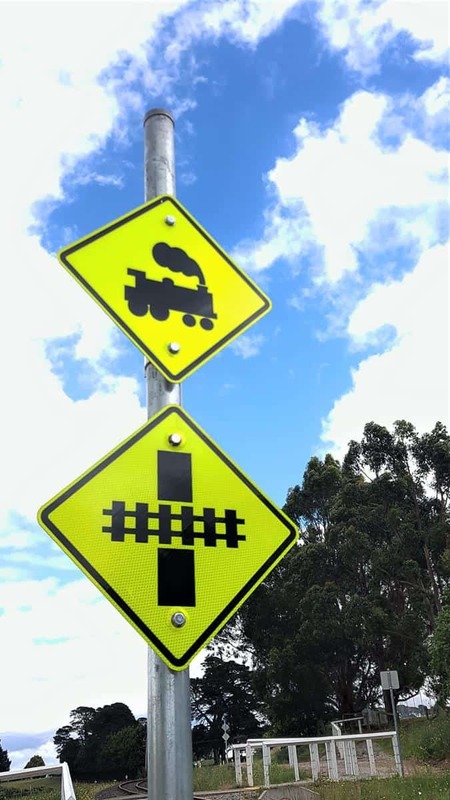 Walkers can also use Puffing Billy as an Option, the station in Gembrook is ideal or the station in Cockatoo can be used, it is not attended, but the train does stop and passengers may board at Cockatoo. Check timetables and costs for Puffing Billy. Dog-friendly on lead. 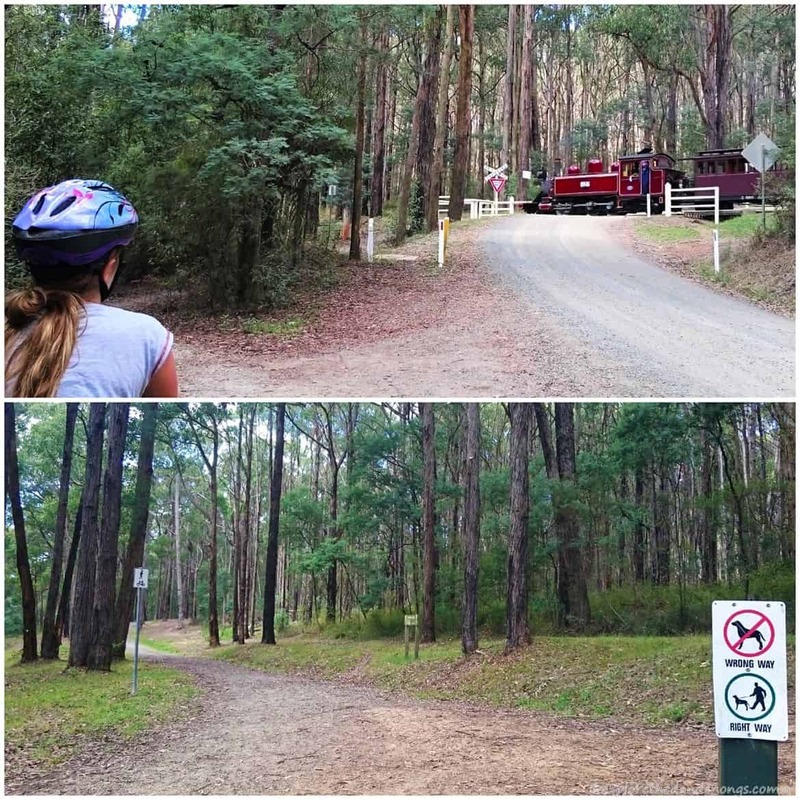 There is an off-lead area called ‘Pepi’s Land’ just over the Puffing Billy line at the start of the trail in Emerald. 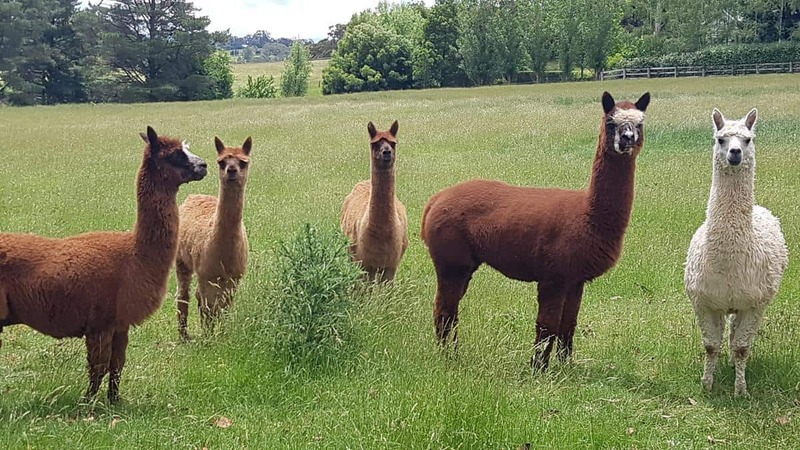 Find more dog walks and off-lead areas in the Dandenongs here. 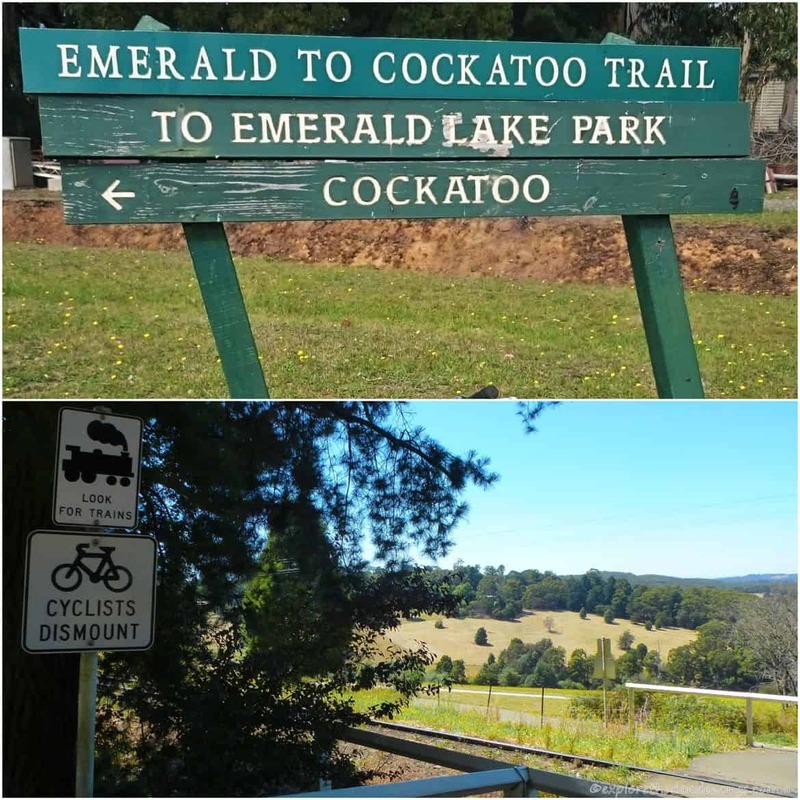 Distance from Emerald to Cockatoo: 6 km each way. 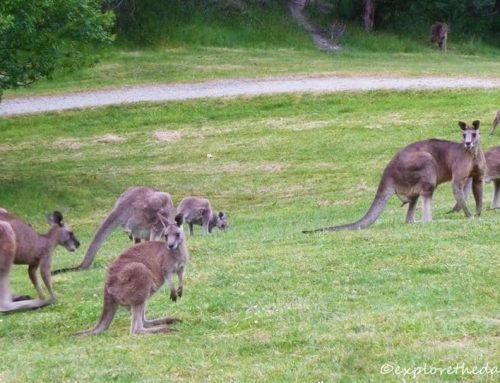 Distance from Cockatoo to Gembrook: 6.5 km each way. Bike Ride: 3-5 Hours return from Emerald to Gembrook, approximately. 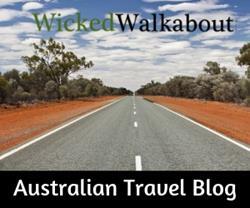 Walking: 5 – 6.5 Hours from Emerald to Gembrook, approximately. Easy > Moderate on well-made made paths with some hilly sections that younger riders may require help on. 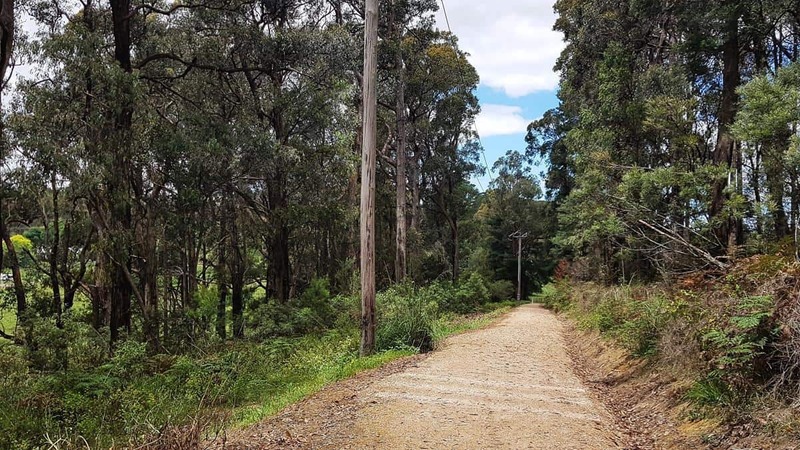 From Emerald, the trail begins where the Puffing Billy Railway line crosses Kilvington Drive, behind the Gemco Players Community theatre. Yellow arrows are quite distinct and are easy to follow. A short distance along the track, cross over the train tracks and follow the path to the left. Carefully cross over the Beaconsfield – Emerald Road and head down Crichton Road. The yellow arrows and signage point off to the right, heading down into Emerald Lake Park. Pass through the main car parking area at the Lake and follow the main entry road around the lake to join the trail again. Crossover Bellbird Crescent, turn right and follow the road a short distance until the track starts again on the left, heading uphill and over the Puffing Billy Train line and into Wright forest and follow the arrows along Wright Track. The trail through the forest is gently undulating and has a good firm surface most of the time. It can be slippery when wet and on some loose gravel. Always use caution. 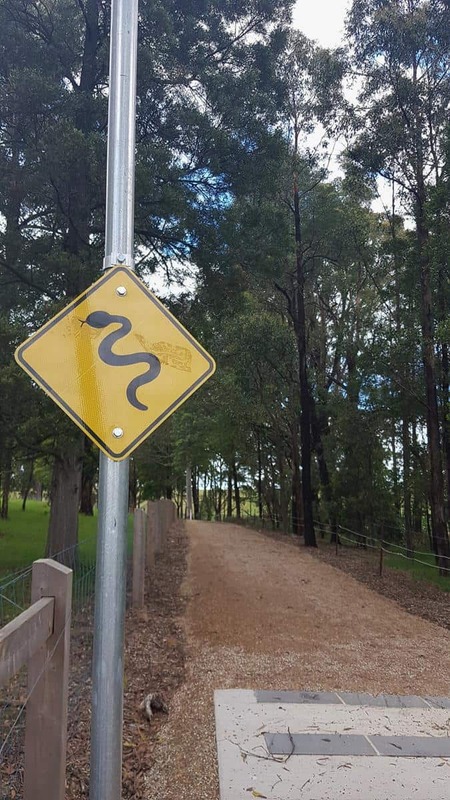 The trail comes out on Bailey Road in Cockatoo, close to the main street. 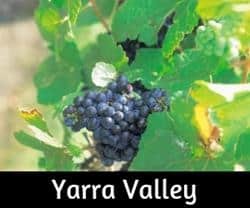 Plenty of cafes and a small IGA in Cockatoo. 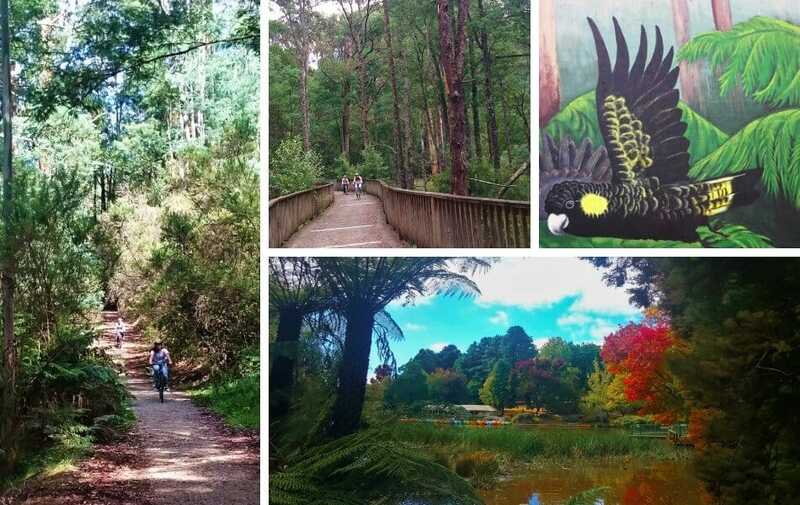 Emerald Lake Park, a popular destination for a picnic, bbq’s and Puffing Billy. Peddle boats for hire, playground, cafe, toilets and outdoor swimming pool. 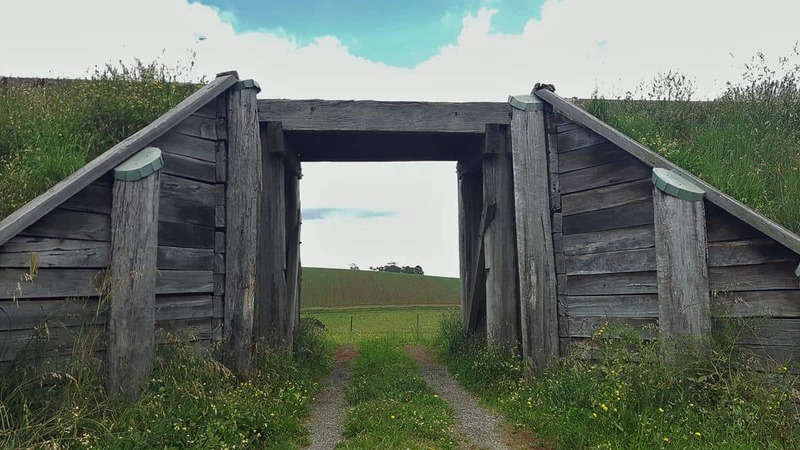 Ride on through woodlands and over a couple of bridges before crossing Bellbird Crescent. Turn right and follow the unmade road until the track begins again on the left… over the Puffing Billy Train track and turn right into Wright’s Forest. Cruise through the forest, following the yellow arrows. Reasonably easy riding with a couple of inclines and downhill sections. Cockatoo! 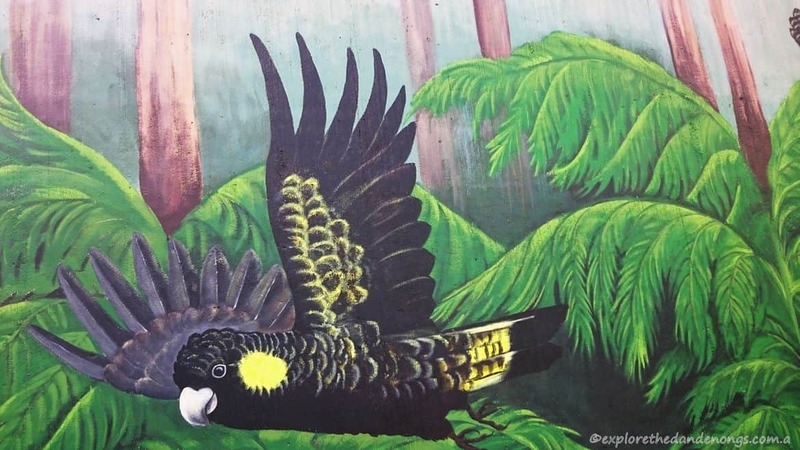 A nice little village with plenty of places to eat and a super mural on McBride’s street depicting yellow tail black cockatoos. 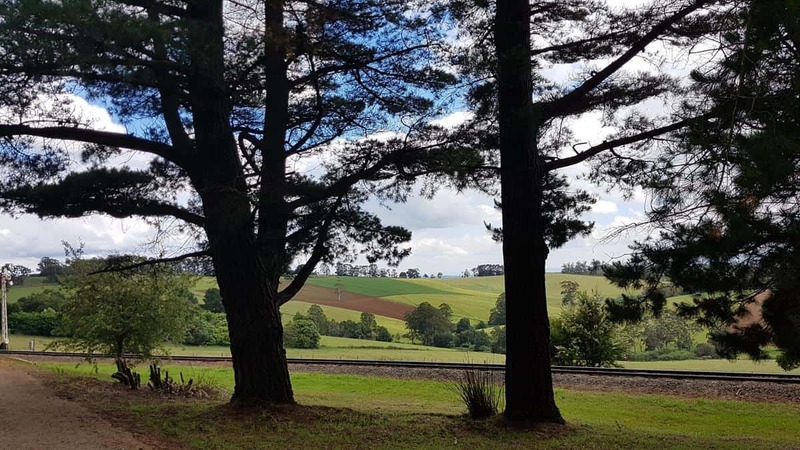 When arriving in Gembrook, the trail finishes by the Puffing Billy Station where there are a small playground and picnic areas as well as good eating spots. Passing by Puffing Billy train track and the Whistle Stop Bed and Breakfast accommodation. This would be an ideal place to stay overnight for anyone wanting to make the ride or walk into a weekend adventure! Looking across farmland to the mountains and even Mt Juliet can be seen – the little peak to the left. Arriving in Gembrook. 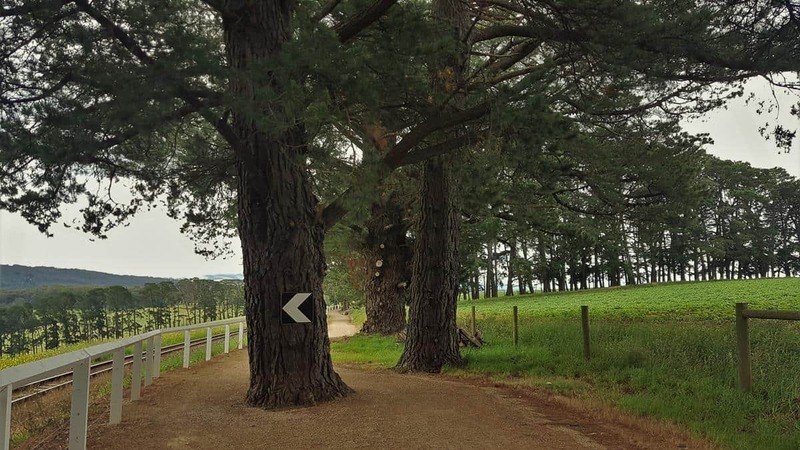 Follow the road into town or turn left through the white gates and arrive at the Puffing Billy Station. 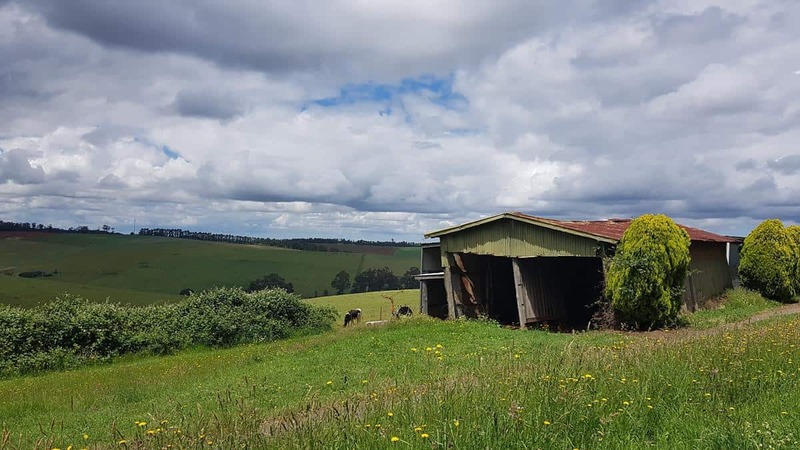 Find out more about Gembrook – Markets, history and the village shops. Agree about the campgrounds, Jane. 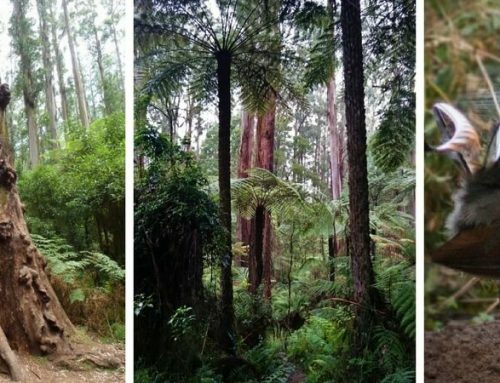 We are working now to link the Gembrook end of the Eastern Dandenong Ranges trail out at least as far as The Pack Track, towards Kurth Kiln, so that walkers / bike riders can get out to the campground and excellent trail network there. 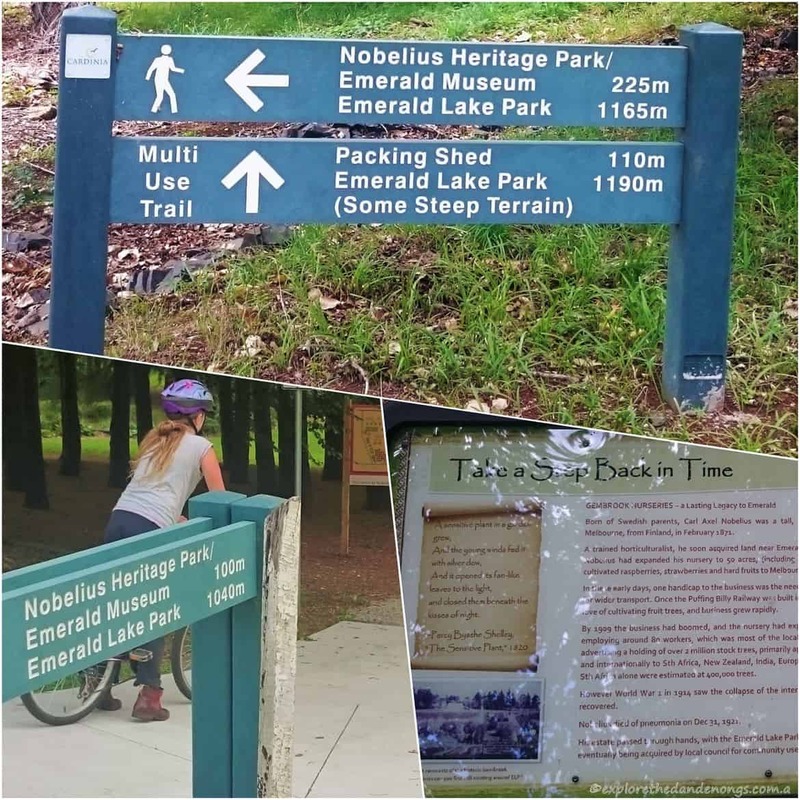 The other great walking spot very close to the Gembrook end of the EDR trail is of course Gembrook Park. Just a few hundred metres down Redwood Road which is opposite the train station. 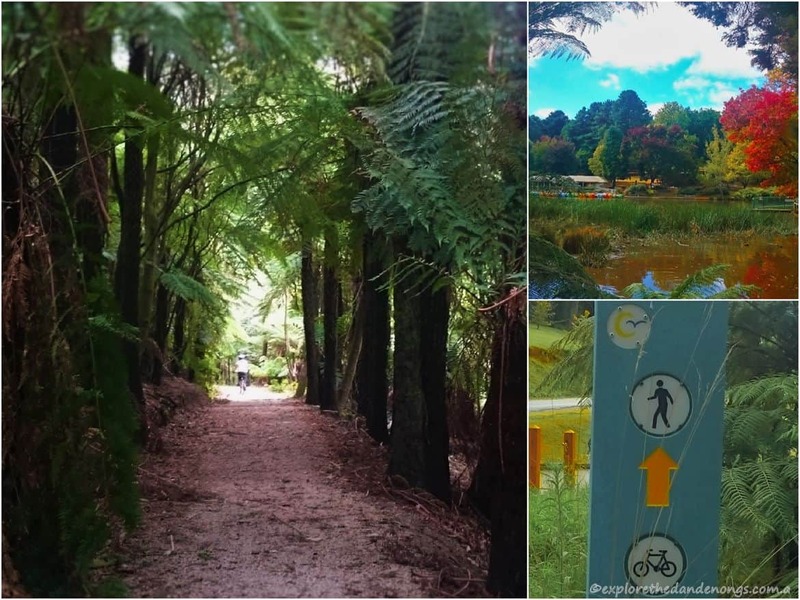 The Friends of Gembrook Park do a great job maintaining the tracks and these are worth a visit any time of the year. Thanks again. Love your website. Thanks for the info about the future plans to hopefully extend the track and the other walking area too. I’ll definitely check them out soon. Kurth Kiln is such a beautiful area too. 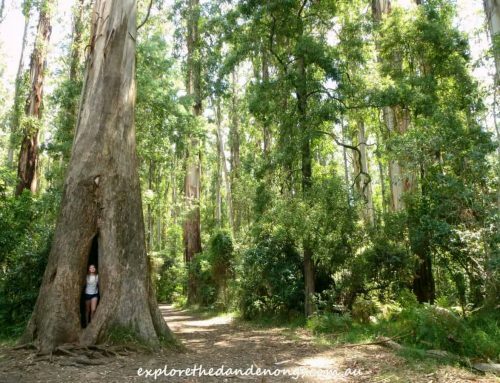 Thanks for the great review of the Eastern Dandenong Ranges trail. 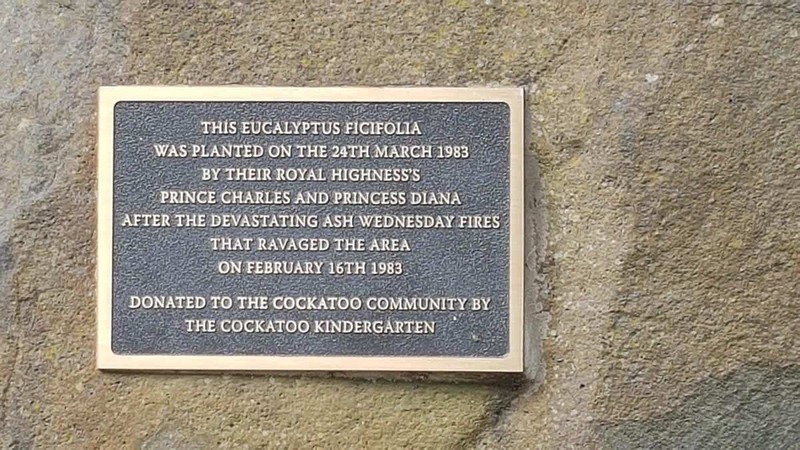 It has been a long project of the Cockatoo Township Committee, the Gembrook Township Committee and the Eastern Dandenong Ranges Association, to join up our hills communities with a trail for locals and visitors to enjoy. Really enjoyed your description. 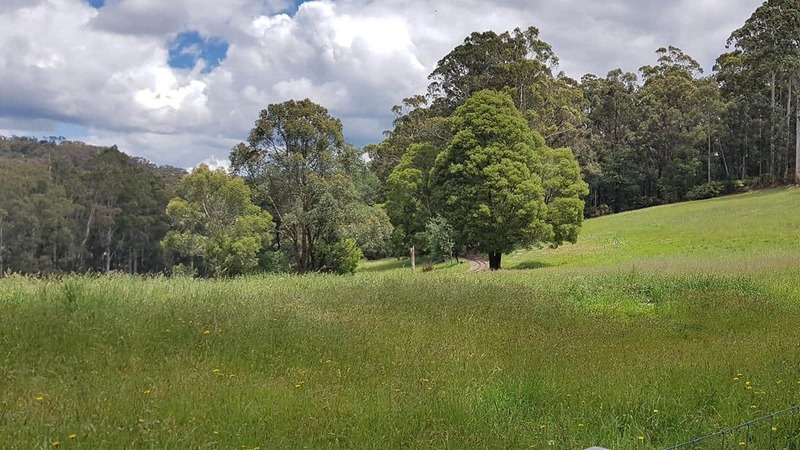 The trail provides a great mix of history, nature, gardens and vistas of the valleys, hills and ridges of our part of the Dandenongs. We are now working on better signs to help join up the trail’s sections more clearly. We feel that in the future the rail-trail opportunities for the trail will open up more. 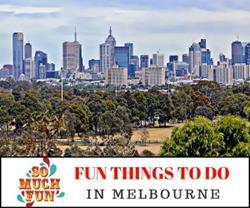 Might even be able to ride/train ride with Puffing Billy ticket options – how good will that be!